"There is nothing nicer than the flavor of fresh tomatoes. You can use canned, but the trouble you take to prepare this dish is worth it. You prepare the sauce while the pasta is cooking, no long hours of waiting. 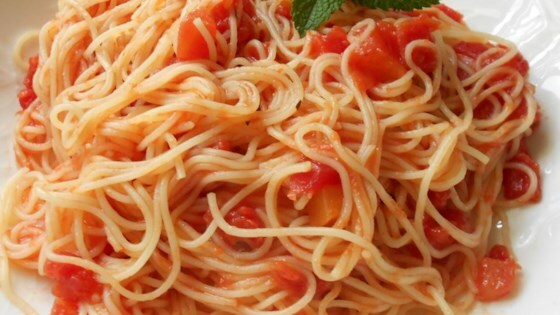 Great if you want meatless pasta." VARIATIONS: Saute fresh quartered mushrooms with the garlic, or add shoestring zucchini along with the tomato. I didn't think this was much to write home about at all. Rather bland if you ask me, but it is quick and easy. Wont make it again. Wow!!! The best and most delicious sauce I have ever tasted!! This is fantastic!!!! The fresh tomato is to die for!! I added mushrooms and onions, and mmm mmm mmm!! !